Convict tradesmen were much sought after by settlers, and in 1829 James Webber was fortunate to have assigned to him a stonemason and plasterer named Dennis Long. Dennis probably played a key role in building Tocal's 1830 stone barn which has survived to the present day. Below: an early photo of Tocal's stone barn, built in 1830 using convict labour. Dennis Long was from the city of Cork in Ireland where at the age of 23 he has convicted of stealing a coat and transported to NSW for seven years. He was assigned to Webber on arrival in 1829 but by 1832 was working in a road gang where he received 50 lashes for absconding. Long became free when his sentence expired in 1835 but he had several further brushes with the law for theft, serving various gaol terms and 12 months in an iron gang in 1842. The sandstone for Tocal's 1830 barn was quarried locally, and two quarries from this period are visible at Tocal today. In the quarries convicts used jumper bars to drill holes in the sandstone, into which they put gunpowder to blow the stone apart. They also used wedges to crack the sandstone into blocks. 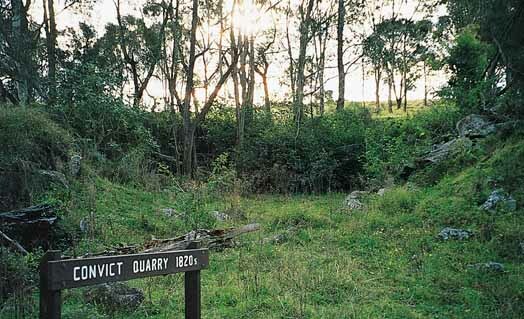 Below: Tocal's 1820s stone quarry.